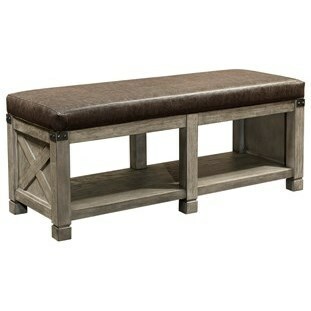 Add this upholstered bench to your bedroom for a rustic accent piece. The lower shelf provides simple storage or display space, while the bonded leather, X shapes, and metal accents speak to farmhouse style. The Tucker Upholstered Bonded Leather Bench by Aspenhome at Darvin Furniture in the Orland Park, Chicago, IL area. Product availability may vary. Contact us for the most current availability on this product. Paint & Finish Options Stone finish. The Tucker collection is a great option if you are looking for furniture in the Orland Park, Chicago, IL area. Browse other items in the Tucker collection from Darvin Furniture in the Orland Park, Chicago, IL area.